This evening, at a presentation at the Lehigh Valley Tech Meetup, I’m opening up public beta access to my new iOS app, Summit – The Adventurous Step Counter. I’ve stitched together a temporary web site for the app as well as a mailing list that will allow you to get access to the final few beta builds prior to public release. If you have an iPhone please consider signing up and giving it a spin. I’d be very grateful for your feedback. Thanks to the 13 private beta testers who have already tested the app and provided feedback. You can expect a brand-new build of the app coming in September. 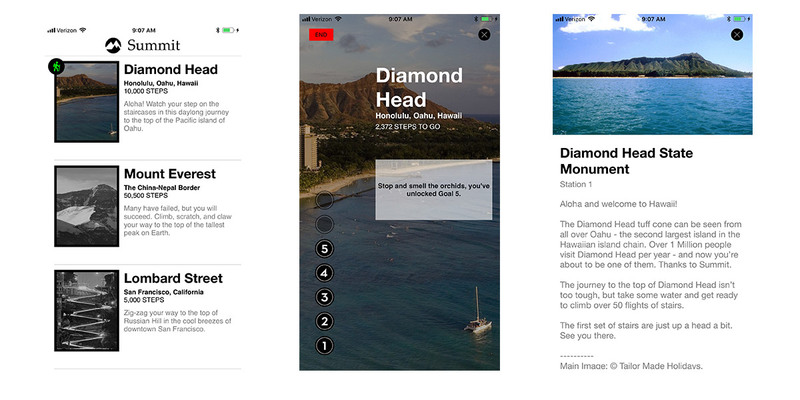 Summit is a free, iOS-only app that uses your step count to virtually hike up tall peaks like Mount Everest in Nepal, learn about amazing landmarks like Diamond Head in Oahu, and even take a leisurely stroll down famous streets like Lombard Street in San Francisco. As you make progress on your journey you’re provided new information at each goal. At the time of public release there will be 5 summits and new summits will be added each month thereafter. When I started on Summit I did not know how to develop an iOS app. It has been really fun to learn Swift, Xcode, iTunes Connect and Test Flight, and the myriad other things I was able to learn in order to get this app as far as I have. I still have a bit of work to do, but I’d love your feedback along the way as I finish the app up for release. That’s a cool idea, Colin. Well done! Great presentation! Look forward to trying the app when you have an Android version. Of course it’s iOS only, sheesh! Congrats and good luck with it! Great demo last night. Looking forward to the Android version! Do you have a recording of the presentation? Yes, there is. I’ll link to it soon. Stay subscribed!